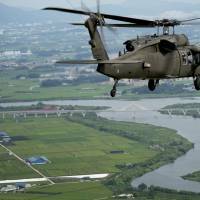 SEOUL/BEIJING - Tension on the Korean peninsula eased slightly on Monday as South Korea’s president said resolving North Korea’s nuclear ambitions must be done peacefully and U.S. officials played down the risk of an imminent war. Concern that North Korea is close to achieving its goal of putting the mainland United States within range of a nuclear weapon has underpinned a spike in tension in recent months. U.S. President Donald Trump warned at the weekend that the U.S. military was “locked and loaded” if North Korea acted unwisely after threatening last week to land missiles near the U.S. Pacific territory of Guam. “There must be no more war on the Korean peninsula. Whatever ups and downs we face, the North Korean nuclear situation must be resolved peacefully,” South Korean President Moon Jae-in told a regular meeting with senior aides and advisers. While backing Trump’s tough talk, U.S. officials including national security adviser H.R. McMaster played down the risk on Sunday of the rhetoric escalating into conflict. U.S. Central Intelligence Agency Director Mike Pompeo said North Korean leader Kim Jong Un might conduct another missile test but talk of being on the cusp of a nuclear war was overstating the risk. “While diplomacy is our preferred means of changing North Korea’s course of action, it is backed by military options,” they said. 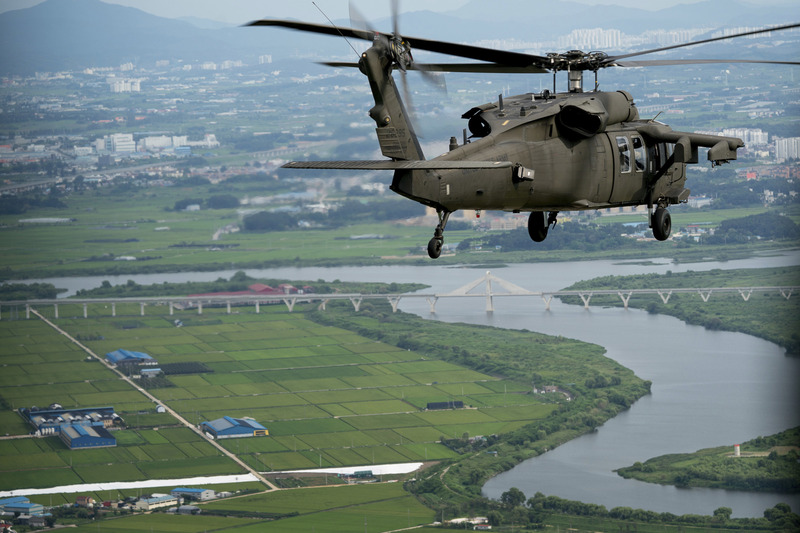 Also Monday, the top U.S. military officer said that the United States wants to peacefully resolve the standoff but is also ready to use the “full range” of its military capabilities in case of provocation. 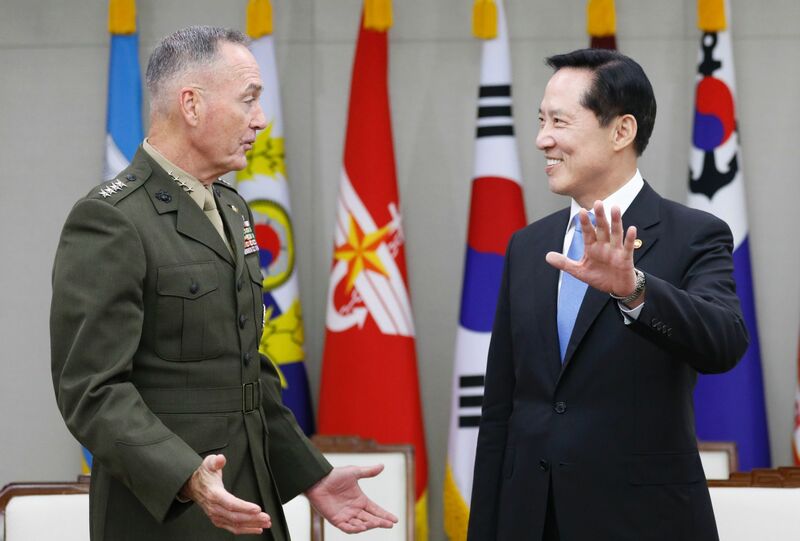 The comments by Marine Corps Gen. Joseph Dunford in a series of meetings with senior South Korean military and political officials and the local media appeared to be part of attempts to ease the regional tensions. 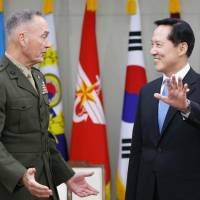 Dunford, the chairman of the Joint Chiefs of Staff, is visiting South Korea, Japan and China. “We are seeking a peaceful resolution to the crisis,” Dunford, who also met with South Korean President Moon, said to reporters, according to a local pool report. World stocks rallied as investors took heart from the less bellicose rhetoric. “Any second Korean War would have no choice but to spread into a nuclear war,” it said in a commentary. South Korean Vice Defence Minister Suh Choo-suk agreed North Korea was likely to continue provocations, including nuclear tests, but did not see a big risk of the North engaging in actual military conflict. Suh again highlighted doubts about North Korea’s claims about its military capability. “Both the United States and South Korea do not believe North Korea has yet completely gained re-entry technology in material engineering terms,” Suh said in remarks televised on Sunday for a Korea Broadcasting System show. Tension in the region has risen since North Korea carried out two nuclear bomb tests last year and two intercontinental ballistic missile tests in July, tests it often conducts to coincide with important national dates. Tuesday marks the anniversary of Japan’s expulsion from the Korean peninsula, a rare holiday celebrated by both the North and the South. Moon and Kim, who has not been seen publicly for several days, are both expected to make addresses on their respective sides of the heavily militarized border. Trump has urged China, the North’s main ally and trading partner, to do more to rein in its neighbor, often linking Beijing’s efforts to comments around U.S.-China trade. China strenuously rejects linking the two issues. Trump will issue an order later on Monday to determine whether to investigate Chinese trade practices that force U.S. firms operating in China to turn over intellectual property, senior administration officials said on Saturday. Chinese Foreign Ministry spokeswoman Hua Chunying said that Beijing has said many times the essence of China-U.S. trade and business ties is mutual benefit and that there is no future in any trade war between China and the United States. China’s Commerce Ministry issued an order on Monday banning imports of coal, iron ore, lead concentrates and ore, lead and sea food from North Korea, effective from Tuesday. The move followed the announcement of U.N. sanctions against North Korea this month which have to be enforced within 30 days by member-states. North Korea, which is angry over the new United Nations sanctions, continued its tough stance on Monday.